"They are in you and me; they created us, body and mind; and their preservation is the ultimate rationale for our existence. They have come a long way, those replicators. Now they go by the name of genes, and we are their survival machines." The words are from The Selfish Gene, by evolutionary biologist Richard Dawkins. And the evening was a celebration of the thirty year anniversary of the publication of his classic book. As I was unable to attend, I asked Helena Cronin, the founder and director of [email protected], (and the author of The Ant and the Peacock), to guest edit this special edition of Edge, and she has kindly provided us with the complete audio of the event as well supervising the editing of the transcribed text. Edge is extremely grateful to her for her efforts. "The illumination of Dawkins' incisive thinking on the intellectual world extends far beyond biology. What a treat to see so clearly how matter and meaning fit together, from fiction to philosophy to molecular biology, all in one unified vision!" "The significance of Dawkins' ideas, for me and many others, runs to his characterization of the very nature of life and to a theme that runs throughout his writings: the possibility of deep commonalities between life and mind." "Notions like Selfish Genes, memes, and extended phenotypes are powerful and exciting. They make me think differently. Unfortunately, I spend a lot of time arguing against people who have overinterpreted these ideas. They're too easily misunderstood as explaining more than they do. So you see, this Dawkins is a dangerous guy. Like Marx. Or Darwin." Part of Dawkins' danger is his emphasis on models derived from cybernetics and information theory, and that such models, when applied to our ideas of life, and in particular, human life, strike some otherwise intelligent people numb and dumb with fear and terror. Some have called the cybernetic idea the most important in 2000 years...since the idea of Jesus Christ. And that would make it one of the most dangerous ideas. "Dawkins’s emphasis on the ethereal commodity called “information” in an age of biology dominated by the concrete molecular mechanisms is another courageous stance. There is no contradiction, of course, between a system being understood in terms of its information content and it being understood in terms of its material substrate. But when it comes down to the deepest understanding of what life is, how it works, and what forms it is likely to take elsewhere in the universe, Dawkins implies that it is abstract conceptions of information, computation, and feedback, and not nucleic acids, sugars, lipids, and proteins, that will lie at the root of the explanation." The world has changed and the biggest change is the accelerated rate of change. On the front page, the news pages, and the OpEd page of The New York Times on any given day you will read about stem cell research, therapeutic cloning, synthesizing genes, Web 2.0, Internet 2, quantum computation, branes, extra dimensions, the Landscape, etc. This is evidence that third culture is the culture, that science is the culture. In the mid-1970s, as a graduate student at Harvard, Robert Trivers wrote five papers that opened the door to the scientific study of human nature. (Trivers also wrote the introduction to the original 1976 edition of The Selfish Gene, restored in the 30th anniversary edition). Since that time, Dawkins, by building on the work of John Maynard Smith, William Hamilton, George C. Williams, and Trivers, and by adding and incorporating his own original, ingenious, and mind-bending ideas, has revolutionized the way we think about science and redefined the role of the public intellectual in western culture. It's not just about science: it's who we are, how we are, and even, how we think. It's not surprising that some people want it all to go away. Around the fifteenth century, the word "humanism" was tied in with the idea of one intellectual whole. A Florentine nobleman knew that to read Dante but ignore science was ridiculous. Leonardo was a great artist, a great scientist, a great technologist. Michelangelo was an even greater artist and engineer. These men were intellectually holistic giants. To them, the idea of embracing humanism while remaining ignorant of the latest scientific and technological achievements would have been incomprehensible. In the twentieth century, a period of great scientific advancement, instead of having science and technology at the center of the intellectual world — of having a unity in which scholarship included science and technology along with literature and art — the official culture kicked them out. Traditional humanities scholars looked at science and technology as some sort of technical special product. Elite universities nudged science out of the liberal arts undergraduate curriculum — and out of the minds of many young people, who, as the new academic establishment, so marginalized themselves that they are no longer within shouting distance of the action. Yet it's the products of this educational system that go straight from their desks at university literary magazines to their offices in the heart of the cultural establishment at our leading newspapers, magazines, and publishers. It's a problem that's systemic and not individual. Unless one is pursuing a career path in science, it is extremely difficult for a non-science major at a top research university to graduate with anything approaching what can be considered an education in science. I recently talked with a noted Italian intellectual, who is as familiar with string theory and as he is with Dante, and writes about both in his philosophical novels. In appraising this situation, he argued for restraint and compassion. "They just don't know," he sighed, "they just don't know." He might well have added, they don't even know that they don't know. Somebody needs to tell them. Otherwise, we wind up with the center of culture based on a closed system, a process of text in/text out, and no empirical contact with the real world. One can only marvel at, for example, art critics who know nothing about visual perception; "social constructionist" literary critics uninterested in the human universals documented by anthropologists; opponents of genetically modified foods, additives, and pesticide residues who are ignorant of genetics and evolutionary biology. As examples, one need only read with astonishment, but not surprise, recent essays in The New York Times Book Review coining pejoratives such as "evolutionism" and "scientism" to critique the set of ideas that inform this edition of Edge. These essays appear not to be driven by any apparent scientific knowledge or expertise, but by a need in the writer to confirm deeply felt superstition-based ideas and/or pre-conceived political models. The message: science is not welcome. But apparently what is welcome is that which writers ignorant of science don't know about their subjects. "When you can't stand the implications of some scientific discipline X, but can't think of any solid objections, you brand them instances of the sin of Xism and then you don't have to take them seriously! What next? A review that warns about the pernicious ''meteorologism'' that keeps scolding us about global warming, or the ''economism'' that has the effrontery to inform us that the gap between rich and poor is growing?" (a) the complete 1 hour and 22 minute audio, available in two formats. You can listen to it as online streaming audio, or you can download it as an mp3 (75 MB) file and play it on your computer, iPod, etc. (b) the 12,000-word transcript of the audio which each of the participants has lightly edited. Stream it. Download it. Listen to it. Print it out. Read it. It is thirty years since The Selfish Gene revolutionised our understanding of living things. Since then, Richard Dawkins' pursuit of the implications of science has informed areas as diverse as biology, psychology, philosophy and religion. His work has made an outstanding contribution to the understanding of science in society; and it has shown how science deepens our appreciation of the natural world. At this event, [email protected], in collaboration with OUP, brings together leading intellectuals to explore these insights — and to make their own distinctive contributions to this fertile field. Author of The Selfish Gene; The Blind Watchmaker; The Ancestor's Tale. Founder and Director of [email protected] and author of The Ant and The Peacock. HELENA CRONIN launched and runs [email protected] She is a Co-Director of LSE's Centre for Philosophy of Natural and Social Science. She is the author of The Ant and the Peacock: Altruism and Sexual Selection from Darwin to Today, which was chosen as one of The New York Times' nine best books of the year for 1992, and co-editor of Darwinism Today, a series of short books by leading figures in the field of evolutionary theory. Each title is an authoritative pocket introduction to the Darwinian ideas that are setting today's intellectual agenda. MELVYN BRAGG is a broadcaster, writer and novelist. He presents In Our Time for BBC Radio 4, a series where he and his expert guests discuss the history of ideas, and explore subjects in culture and science. He presented Start the Week between 1988 and 1998. In his 1998 series On Giant's Shoulders he interviewed scientists about their eminent predecessors, and from 1999 to 2001 he presented The Routes of English, a series celebrating 1,000 years of the spoken language. As well as presenting for Radio 4, he is Controller of Arts for London Weekend Television and is the presenter of The South Bank Show. In 1998 he was made a life peer (Lord Bragg of Wigton). He has written 19 novels, the latest of which is Crossing the Lines. They are in you and me; they created us, body and mind; and their preservation is the ultimate rationale for our existence. They have come a long way, those replicators. Now they go by the name of genes, and we are their survival machines. In 1976, a young zoology lecturer at Oxford University published his first book, from which those words are taken. Powerfully encapsulating a gene's-eye view of life, The Selfish Gene rapidly became deeply influential both within biology and associated disciplines, and in wider intellectual debate. Thirty years and over a million copies later, The Selfish Gene has come to be seen as one of the defining books of the twentieth century. To commemorate this thirtieth anniversary, Oxford University Press has published a sparkling new edition, with a fresh introduction by the author and an extensive collection of reviews that are testimony to the book's importance and influence. 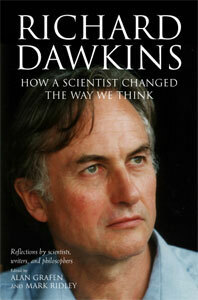 And more … Today also sees the publication of another OUP book: Richard Dawkins: How a scientist changed the way we think. It is edited by Alan Grafen and Mark Ridley, both former students of Richard's. The book is a collection of essays by scientists, philosophers and writers, which reflects on Richard's contribution and influence as scientist, rationalist, writer and public intellectual, in areas such as biology, philosophy, evolutionary psychology, artificial life and debates on religion. Our event today is the launch of this lively and wide-ranging collection. Tonight, [email protected] and OUP have brought together some of these and other intellectuals with Richard, to explore these insights further and to make their own distinctive contributions. So … welcome, everyone, to 'The Selfish Gene: Thirty years on'. [MELVYN BRAGG:] Our first speaker is DANIEL DENNETT. A professor at Tufts University, Dan is an outstanding polemicist and one of those all-too-rare philosophers who takes science, particularly Darwinian theory, seriously. His books include Brainstorms, Brainchildren, Elbow Room, Consciousness Explained, Darwin's Dangerous Idea and — a new book, published this week — Breaking the Spell, an original and comprehensive explanation of religious belief. Dan's talk takes 'The view from Dawkins' mountain'. DANIEL DENNETT: 'The view from Dawkins' mountain'. We are survival machines, robot machines, blindly programmed to preserve the selfish molecules known as genes. Thirty years on I think the question that can be raised is, are we still astonished by this remarkable inversion, this strange inversion of reasoning that we find in this claim? When I read the book it changed my life. I was a Darwinian, but I didn't understand evolutionary theory at all well, and I thought after 30 years I should go back and re-read the book again. I was a bit afraid — I'd read parts of it many times, because I'd assigned it to my students in many courses — philosophy courses, even. I wondered if re-reading the whole book I would have one of those disappointing experiences where you think, well, yes, this was a young man's book, and this was very exciting at the time, but I wonder how well it holds up. So I thought I would put it to as stern a test as I knew, and so last June I took it with me, the more recent edition, on a two-week trip to the Galapagos, where I spent a week on a wonderful three-masted schooner, the Sagitta, retracing Darwin's footsteps with some excellent evolutionary biologists, who were there for the World Summit of Evolution. That's a pretty good test of a book. That's where I reread the book, and it came through with flying colors. It was a wonderful accompaniment to that wonderful and amazing week. When I thought about which features of the book I would talk about tonight, knowing who the others were who were going to be speaking about it, I realized that I should perhaps stick to some of the grander, larger, more philosophical themes and leave some of the wonderful details to people who are more expert in those. I want to say what a Darwinian fundamentalist is. A Darwinian fundamentalist is one who recognizes that either you shun Darwinian evolution altogether, or you turn the traditional universe upside down and you accept that mind, meaning, and purpose are not the cause but the fairly recent effects of the mechanistic mill of Darwinian algorithms. It is the unexceptioned view that mind, meaning, and purpose are not the original driving engines, but recent effects that marks, I think, the true Darwinian fundamentalist. And Dawkins insists, and I agree wholeheartedly, that there aren't any good compromise positions. Many have tried to find a compromise position, which salvages something of the traditional right-side-up view, where meaning and purpose rain down from on high. It cannot be done. And the recognition that it cannot be done is I would say, the mark of sane Darwinian fundamentalism. How on earth is it possible to adopt such a position? Evolution itself seems to be such a mindless and cruel thing. How can such heartless culling produce the magnificent designs that we see around us? It seems just about impossible that such a simple mechanical sieve could produce such amazing design in the biosphere. One of the key elements in The Selfish Gene, one that has always struck me as particularly valuable to me, strengthening my resolve in my own work, and also showing the way, is what I'm going to call by the rather bizarre name of "mentalistic behaviorism". First I want to remind you of what Francis Crick called Orgel's Second Rule. "Evolution is cleverer than you are." Now what Crick meant by this jape, of course, was that again and again and again evolutionists, molecular biologists, biologists in general, see some aspect of nature which seems to them to be sort of pointless or daft or doesn't make much sense — and then they later discover it's in fact an exquisitely ingenious design — it is a brilliant piece of design — that's what Francis Crick means by Orgel's Second Rule. But notice that this might almost look like a slogan for Intelligent Design theory. Certainly Crick was not suggesting that the process of evolution was a process of intelligent design. But then how can evolution be cleverer than you are? What you have to understand is that the process itself has no foresight; it's entirely mechanical; has no purpose — but it just happens that that very process dredges up, discovers, again and again and again, the most wonderfully brilliant designs — and these designs have a rationale. We can make sense of them. We can reverse-engineer them, and understand why they are the wonderful designs they are. And what this suggests is that it would help us to understand how this is possible if we could break all this brilliant design work up, into processes which we could understand the rationale of, without attributing it to the reason of some intelligent designer. In other words what we need is this weird thing that I'm calling "mentalistic behaviorism". Now to many the idea of mentalistic behaviorism would seem to be a contradiction in terms. Classical psychological behaviorism is profoundly and explicitly anti-mentalistic. So what on earth could mentalistic behaviorism be? It could be exactly what Richard writes about in The Selfish Gene. How on earth can a gene be selfish? It doesn't even have a mind. It is just a bunch of information in the genome; how could it be selfish? And what Richard showed, patiently, vividly, clearly, again and again, is if you treat it as if it had a mind, if you treat it mentalistically, you can characterize and make sense of the interactions, the dynamics of the processes that produce the effects that strike us as so intelligent. What we can then see is that these processes are arms races. Not just arms races between armies of intelligent people, but arms races between trees, and between bacteria, and between any form of life you want to name. We can watch an arms race generate more and more design, more exquisite solutions to problems, in ways that are strikingly similar to the more intelligently (but not very intelligently) guided arms races that give us the metaphor in the first place. Also we find bargains struck, wonderfully intelligent bargains struck, for instance, between fruit-producing plants and omnivorous animals that carry the fruit off and pay for this high-energy fruit by distributing the seeds with their fertilizer at some distance from the tree, just to give one vivid case. Many wonderful bargains, many ploys and counter-ploys which can be described in this mentalistic language at the same time that one rigorously insists: these things don't have minds, they are just mechanical processes, they are simply structures that have effects in the world that invite this particular metaphorical — but quite rigorously metaphorical — interpretation. I have recently hit upon a way of characterizing what a virus is, which I like, and which I see a lot of evolutionary biologists like too: a virus is a string of nucleic acid with attitude! Of course it doesn't have a mind, but it has attitude. What does that "attitude" mean? It means that it behaves in such a way that it promotes its own replication, more than its rivals promote their own replication. That's what it is to be a virus. Now I want to return to the quote I began with — "We are survival machines, robot vehicles, blindly programmed to preserve the selfish molecules known as genes" — because I want to talk about the other philosophically brilliant contribution in The Selfish Gene. The first one is the pioneering clear articulation of mentalistic behaviorism and the defense of it. We can use selfish gene talk because we know how to translate that into terms that are purely behavioristic. But now I want to concentrate on another word in that phrase, "the selfish molecules known as genes." That, I think, is a nice example of Richard's writing skill. The first time he describes them, he calls genes selfish molecules, but later in the book, once we've gotten used to this way of talking, he shows that that's actually not quite what he is talking about. He's saying something much more subtle and much more interesting. What a philosopher would say is that a gene, it turns out, is a type, not a token. What I am doing is emphasizing the potential near-immortality of a gene in the form of copies as its defining property. In other words he was saying something quite remarkable. He was saying that genes are like words, or like novels, or like plays, or melodies! Now of course one of the famous (and most embattled) chapters in The Selfish Gene, one that I have spent a lot of time articulating and defending and trying to extrapolate further, is the chapter on memes. And there he said memes are like genes. What I want to point out, if it isn't already obvious, is that earlier in the book he said that genes are like memes! He said that genes are information structures that have many tokens, many physical tokens, and it's the information that you're really talking about when you're talking about the gene. Now this of course was not entirely original to Richard. It was also stressed by George Williams, for instance, in his own work which was one of the inspirations for Richard. In other words, the hox genes are like the Romeo and Juliet memes! There's many copies of them, we can recognize them, we can see the role that they play in many different contexts. And they are all related not only by similarity but by having been copied and copied and copied, having all been replications coming from earlier instances. Here on the screen is a diagram of the tree of life. It may not look like a tree to you, because you're not used to seeing trees from this angle — this is a bird's-eye view of a tree. You're looking down from above. You see the main trunk right in the middle there. This diagram is already out of date; I've had some interesting discussions with evolutionary biologists in the last two weeks and I've learned that some of them would draw the lines rather differently now. But it shows the three main branches of the tree — the bacteria, the archaea, and the eukarya, and of course we're on this lower eukaryote branch, and there we are, Homo — and the artist has put two other close cousins on the tree of life on this map — Coprinus and Zea. What are those? Mushrooms and corn — our close cousins! Now one of these species, Homo sapiens, is exceptional: of all the species on the planet, it is the only species that has evolved that can understand that it's one of the fruits on the tree of life. We are unique in that regard. It is human language and culture that has made this possible. Not just our brain power, but the fact that we have a division of labor — because we have language and culture we can fill our brains with the fruits of the labors of everybody else on earth, not merely those who are our ancestors. Tonight we celebrate one of its most brilliant creations, The Selfish Gene. [MELVYN BRAGG:] Thank you very much. Our next speaker is SIR JOHN KREBS. A Fellow of the Royal Society and until last year a Royal Society Research Professor in Oxford's Department of Zoology, John is a highly distinguished biologist. He is one of the founding fathers of behavioural ecology, having co-edited the leading textbooks on the subject; and, with Richard, he has co-authored some classic papers in evolutionary thinking. Having been head of the Natural Environment Research Council (NERC) and of the Food Standards Agency, he is now Principal of Jesus College, Oxford. John's talk is entitled 'From intellectual plumbing to arms races'. Thank you very much, Melvyn. I've got half as much time as Dan, so I'm going to have to talk twice as fast — or say half as much. "God is here but everywhere; Dawkins is everywhere but here." Richard does travel around quite a bit. Also of course the challenge of giving a very short talk is the one that Mark Twain summarized in the famous phrase, "If I'd had more time I'd have written a shorter letter. " But first let me talk about Richard as an intellectual plumber. I first came across the notion of an intellectual plumber when I was sitting in my then Oxford College, Pembroke, next to Simon Blackburn, the philosopher now at Cambridge. I turned to him and asked, "What's the point of philosophy anyway, Simon?" And he said, "Well, think of it this way, John. You're just a biologist, you sometimes have leaks in your thinking, and what you need is an intellectual plumber to patch up those leaks, and that's what philosophy will do for you. " This is one way of describing Richard. He is indeed an intellectual plumber, and if anybody has leaks in their scientific thinking, be it about evolution or about any other aspect of biology or science in general, Richard's intelligence and razor-sharp analysis will detect the leak and carefully fix it for you. That's a beautiful deconstruction of cultural relativism. But — you might say, supposing Richard was wrong? Well, here I'm tempted to quote Lord Carrington, when asked what would happen if Margaret Thatcher was run over by a bus. And his reply was, "It wouldn't dare." But I want now to move on from Richard as an intellectual plumber to talk about another aspect of Richard's contribution to biology, which is about a really original idea, a really original way of looking at a very familiar phenomenon. Now ideas of course never come out of a vacuum. So The Selfish Gene, a highly original book, by everybody's reckoning, was born out of a particular zoological environment. Richard was a student at Oxford in the 1950s and early '60s, which was a center of neo-Darwin in biology. People like Niko Tinbergen, David Lack, E. B. Ford, had already begun to articulate the debate about levels of natural selection: does selection act to the level of the group, the individual, or the gene? It was also an environment in which there'd been huge success at popularizing biology, in particular behavior. For example, in the writings of Niko Tinbergen and Desmond Morris, who was also associated with the department. But to see just how radical Richard's ideas were in this overall context, let's look at his writing about communication. And that's what I want to talk about for the next few minutes. What do you think the essence of communication is? Whether it's communication amongst human beings, or amongst other animals on the planet, or amongst plants? Well, at the time when Richard entered into this field, ethologists, information theorists, social psychologists, and others, all agreed that the essence of communication is transfer of information. That's what it's all about. And those who thought more specifically about animal behavior and evolution saw the whole process by which animal communication has developed by natural selection as one in which the efficiency of information transfer is increased. Richard's supervisor, the Nobel-prize winning Niko Tinbergen, made a very famous film called "Signals for Survival," which won all sorts of international prizes, and the opening phrase of that film, which is all about animal communication, is a memorable moment, with Niko standing there in a colony of herring gulls in the North of England, and as he talks to the camera he raises his fist and he says, with a Dutch accent, "When I do this, you know what I mean. " "One party, the actor, emits a signal, to which the other party, the re-actor, responds, in a way that the welfare of the species is promoted." "Natural selection favors individuals who successfully manipulate other individuals. Whether or not this is to the advantage of the manipulated individuals. Selection will also work on individuals to make them resist manipulation. But actors do sometimes succeed in subverting the nervous systems of re-actors. As adaptation to do this are the phenomena we see as animal communication." In other words, Richard reframes the whole of thinking about communication. It is not about information transfer, but about manipulation. It is about an arms race between manipulators and recipients of manipulation. And so influential is that idea, that in a recent monograph on animal communication by two American scientists, they start the history of the subject with Richard's paper. Let me just make three comments as I move towards the end. The first thing you may ask if you think about communication as manipulation, how on earth could manipulation succeed? Surely reactors, over evolutionary time, would develop the capacity to resist manipulation. Before you get too seduced by that thought, think of your own senses, and the way they can be manipulated. Otherwise, why is it that men are influenced by motor cars with semi-naked women draped over them? It's manipulating the senses, persuading men that they might indeed attract semi-naked women of a certain kind if they bought that particular make of car. [I own a BMW and I can confirm that it doesn't have this effect.] Think of people who respond to pornographic images, flat images of color, but are sufficiently aroused by them to think of them as real sexual stimuli. "My heart aches and a drowsy numbness pains my sense as though of hemlock I had drunk." The nightingale’s song is making him drowsy and numb as though he'd drunk hemlock. But there's another factor why signals might be manipulative. Think of how signaling might start — the reactor anticipating the behavior of the actor, and that very anticipation creating the basis for signals that manipulate. The second point I want to make is that this idea about communications manipulation becomes all the more troubling when you think that each individual can play the role of actor or re-actor. So we're not talking about evolution between individuals, but evolutionary interactions between roles. And this is an example in the way in which, as Dan has already articulated, jumping out of the mind set of thinking of the individual as the unit of evolution enables you to free your thoughts and be creative. And finally, my third point here is this. If communication is the result of an arms race between manipulation and resistance, what's the end point? And here Richard had further insight. The kind of end point you would expect depends on the degree of conflict of interest between the two roles. In cases where the conflict is very strong, like males attracting females when the females are reluctant to mate, the arms race between manipulation and resistance results in an escalation. And that's why you get brilliantly elaborate, vocal, visual, and other signals associated with sexual displays. On the other hand, if the conflict of interest between the roles is minimal, as it might be between members of a pair who have already mated, then the evolutionary process will lead to a reduction in the visibility, the amplitude, of the signal. And that dichotomy in the nature of communication is still one that stands to be investigated by biologists. So in summary, Richard's writing about communication transformed our thinking about not just animal communication, but, I believe, about communication in general. And a final comment: people sometimes say to me, what was Richard doing before he wrote The Selfish Gene? What was he known for. And the answer is, Richard was known for his organ before he wrote The Selfish Gene. There's nothing personal, Richard, you understand. But Richard did invent a device for event-recording with a computer. This was in the very early days of computing. It's hard to imagine that what you now have in a laptop took a room as big as the average academic's office to process information and store it. And Richard invented the so-called Dawkins Organ, which was a device for recording data by pressing keys and that went straight into a computer. The other particular thing that Richard did early in his career was to study the development of pecking behavior in chicks. When I came to write my own thesis, I read Richard's thesis as an example of how it should be done. And I was struck by a sentence in the very first Chapter, in which under "methods" it said, "The chicks were tested in Paris. And I thought, my God, this man's got real style. It was only about ten minutes later that I realized that it was a misprint for "The chicks were tested in pairs. " And now to MATT RIDLEY. 23 pairs of chromosomes, together with a doctorate from Oxford University, equipped Matt for a career as a top-rank science writer. He has worked for The Economist, the Daily Telegraph and the Sunday Telegraph. His books — The Red Queen, The Origins of Virtue, Genome, Nature via Nurture — have sold over half a million copies and been short-listed for six literary prizes; and in 2004 he won the American National Academies Book Award. He is the energetic founding chairman of Newcastle-upon-Tyne's International Centre for Life, which is highly regarded for its research in genetics. Matt will talk about 'Selfish DNA and the junk in the genome'. Thank you very much, Melvyn. Good evening; it's a huge honor to be here. I'm only here because I intercepted an invitation for Mark Ridley. Just to be clear, the excellent book about Richard is edited by Alan Grafen and Mark, not by me, although I do have a chapter in it, just to confuse people. We have, Mark and I have had our Y chromosomes analyzed by Brian Sykes and we have the same Y chromosomes haplotypes, so he'd say the same thing as I'm going to say anyway. After all, we are supposed to believe in genetic determinism. What I want to talk about tonight is a throwaway remark in The Selfish Gene, which I think was not only prophetic but in a sense made the book much more literal than it otherwise is. At the time, in the early 1970s, it had just been discovered that genomes have a lot more DNA in them than is necessary for coding for proteins. And this was a big puzzle. Richard suggested a solution to this, which turned out to be mostly true, and was completely original. Biologists are wracking their brains trying to think what useful tasks this apparently surplus DNA in the genome is doing. But for the point of view of the selfish genes themselves there is no paradox. The true "purpose" of DNA is to survive, no more no less. The simplest way to explain the surplus DNA is to suppose that it is a parasite, or at best a harmless but useless passenger hitching a ride in the survival machines created by other DNA. And as a classic of the argument in The Selfish Gene, what he's doing is saying cui bono, who benefits. Is it possible that perhaps this stuff is there not for the good of the species, but for the good — not even for the good of the whole genome, but for the good of the bits of DNA itself. He's turning the world upside down. Just to recount the history of why this is an interesting question, by 1971 the phrase the C-value paradox had been coined for this problem, that nuclear genomes vary enormously in size, up to 300,000-fold, but the number of proteins made from them doesn't vary nearly as much. Some species have enormous genomes and produce no more proteins than others. The idea was beginning to be abroad in the late '60s, early '70s, that this might just be junk — that an awful lot of the DNA in the genome might stand for nothing; it might have no purpose. And in a lecture at MIT in 1972 Crick said, What is all this DNA for? Is it junk or is it an evolutionary reserve? Still thinking, though, in terms of what's it for in terms of the organism. And in 1978 Tom Cavalier-Smith suggested that perhaps it's there to support the rest of the DNA, to place the genes in the right parts of the nucleus, to spread the genes out, and things like that. And that's an idea that I'll come back to in a minute, because it has a second history. But it's in 1980 that the idea of selfish DNA is coined in two papers in Nature by Doolittle and Sapienza and Orgel and Crick, arguing that perhaps most of, or some of this DNA is simply selfish DNA, that it's there because it's good at getting itself there. It's good at replicating itself, it's good at copying itself. They were quite explicit, they said this idea is not new, it's sketched briefly but clearly by Dawkins in his book The Selfish Gene. There's no question that this originated as an idea with Richard. By the way, — in 1982 the first computer virus was created, the Elk Cloner virus — and that of course has an interesting parallel with the argument that I'm talking about. Just to illustrate what we're talking about — genome size bears very little relation to the complexity of an organism; two creatures like a puffer fish and a zebra fish have very different size genomes, even though they look very similar. From this end of the telescope, human beings look like they have quite a big genome, but if you turn the telescope around and look from another direction, the human genome looks rather a small one, compared with that of grasshoppers, which is at least three times as large, or deep-sea shrimps, which have ten times as much DNA as us. Salamanders get even bigger, and the king of the genomes in the animal kingdom at least, is the marbled lung fish. Some people say amoebae have larger genomes at 500 gigabases, but they're almost certainly polyploid, as are lilies, which also have very big genomes. This is a perfectly ordinary diploid genome in the marbled lungfish, and it has as much digital information in it as about ten British Museum reading rooms. So what's it all for? Well, it does appear that Richard was partly wrong. It does appear that the genome size is under selection, and that it's linked to the size of the cell. The bigger the nucleus the bigger the cell, it's a pretty good rule. And there's all sorts of evidence to suggest that animals are optimizing the size of their genomes, so parasites often minimize the amount of junk in their genomes in order to shrink themselves. Malaria parasites have very little junk in their genomes, and very small cells. At the other extreme, ciliates have very large cells, and they achieve this with small genomes by making a huge macronucleus in which they put sort of working copies of all their genes in multiple numbers. They are an exception that proves the rules; they have a small genome but a large cell but only because they make a special sort of working nucleus that's a whole lot bigger. And high-metabolism animals, like bats, and birds, have got rid of quite a lot of the junk in their genome, in order to be able, it appears, to have small blood cells with larger surface areas. A lesser horseshoe bat like this has a genome less than two gigabases, compared with three gigabases for us. Why the lungfish, the marble lungfish, has such a gigantic genome is not clear, but it does look like it may be something to do with having very big cells, in order to be able to store glycogen when it estivates during a drought, when it disappears into the mud and lives there for six months off its glycogen reserves. That's a possibility. But one of the strongest pieces of evidence that genome size is not — that it's not possible simply to expand your genome at length by letting parasites run riot is the ALU sequence, which is one of the commonest sequences in our genomes, which has appeared in the last 30 or 40 million years. Mice don't have it, but our genome is not bigger than mice. In other words it's come at the expense of another sequence, rather than added to it. Just in passing, it does seem that big genomes go with small brains. This is particularly true in amphibia, where — in frogs and salamanders, the larger the genome the smaller the brain. A frog has about five gigabytes and a comparably large brain; a salamander has about 30 gigabytes and a smaller brain, and a mudpuppy has an 85- gigabase — sorry, I keep saying byte, I mean base — gigabase genome, and has an extremely small brain. Human beings luckily have larger brains than frogs. There are two reasons for this: the bigger your genome the slower you are at duplicating yourselves, so the harder it is to grow a big brain by multiplying cells. And also it's harder to fit the same number of neurons in your head if neuron bodies are bigger. How much of the human genome might be selfish DNA? Well, what we think of the genomes consisting of is genes; well, there is the proportion of our genome that actually consists of real protein-coating genes, sequences that direct the manufacture of proteins themselves. One and a half percent. Add in another three and a half percent for all the control sequences, all the functional DNA that seems to be under very strong purifying selection. That's where all the promoters and enhancers and switches that control the expression of the genes is. We've only got to five percent and we've got all that we need to build and run a human body. Eight percent consists of retro-viruses. 450,000 copies of the retroviruses, complete or incomplete, in our genomes. They're there because they're good at being there; they're simply left over from infections in the past, with viruses that are good at stitching copies of themselves back into our genes. There's three percent transposons — these are just cut-and- paste sequences that are good at moving around the genome. Many more of them in plants and fruit flies, but fewer in us. But the really interesting ones are the LINEs: long interspersed nuclear elements. Or autonomous retroposons. These are sequences that are several thousand base pairs long, they're transcribed, two proteins are made from them, the proteins bind to the messenger RNA and take it straight back into the nucleus, make a DNA copy, and stitch it back into the genes. That's all they ever do. They are as clear a definition as you can get of a selfish gene, they are simply copying themselves and spreading themselves around the nucleus. The SINEs are very similar, there's 13 percent of our genomes consist of them. The ALU that I mentioned is one of these. The only difference is that they parasitize the LINEs. They don't make their own machinery for copying themselves, they use the LINE machinery. These are lesser fleas on greater fleas. All that gets you to about half the human genome. What's left? Well, there's introns — gaps inside genes — there's simple sequence repeats, the bits we use for DNA finger printing and things like that, segmental duplications, and a whole bunch of other stuff. Broadly speaking, the green stuff I think is true junk DNA. In other words it doesn't matter what its sequence is. The blue stuff is the functional DNA that builds and runs our bodies. And the red stuff is there because it's good at being there. It's things that have spread at the expense of other sequences, it's selfish DNA. Just to clarify the LINEs and SINEs, at any given time in the last 60,000,000 years there's been one different LINE that's been dominant, that's been most dominant in the human lineage, there's been 16 overall that have been rampaging through our genomes. The one that's currently doing so is called LINE 1, it's at the moment taking up about 17 and a half percent of your genome as you sit here today. Likewise the ALU sequences have gone berserk, their activity peaked about 40,000,000 years ago in the primate lineage, it's a 280-base per sequence, and it's repeated over a million times. Now interestingly the LINEs are found in the AT-rich regions. These are where there's fewest genes — which is what you'd expect if the organism was saying, we don't like these parasites, we want to keep them out of the way of genes. But the older SINEs are actually found in the CG-rich regions, the areas where most genes are. In other words the longer a SINE has been hanging around, the more it's been recruited to areas where there are genes, so it looks like the organism has somehow co-opted some of these sequences to actually affect the expression of genes, which is an interesting case of a selfish gene being, if you like, tamed. Just worth reminding ourselves that junk DNA has spawned a bigger industry than coding DNA already — I'm referred to DNA finger-printing — and the two people of course who made DNA a household word are, Monica Lewinsky and O.J. Simpson, if you think about it. Ladies and gentlemen, my conclusion is that it looks like about 45 percent of the human genome is made up of what you might literally call selfish genes — sequences that copy themselves very efficiently. And that Richard's suggestion was right. However, selfish DNA can, it seems, spread at the expense of neutral junk, but doesn't seem to be able to actually expand the genome. We're not in danger of suddenly have our genomes grow bigger and bigger and bigger. And these selfish elements range from unwanted parasites to co-opted symbionts, and most of them are somewhere in between the two. Richard was absolutely right, in a very literal sense, and the genome would actually be inexplicable without the notion of the selfish gene. [MELVYN BRAGG:] Our next speaker is IAN McEWAN. Ian's books have earned him worldwide critical acclaim. Shortlisted for the Booker Prize for Fiction three times, he won the award in 1998 for Amsterdam. And many other prizes span his career, from an early Somerset Maugham Award to the triumph of a Book Critics' award. Ian is a writer who understands and respects science. His book Enduring Love draws on explicit Darwinian themes; and his latest novel, Saturday, is based on a day in the life of a brain surgeon. Let me start with the opening of an essay on immunology, which might entertain you. And this is in sense an appeal for a grand parlor game among those who love science. 'It is whispered in Christian Europe that the English are mad and maniacs: mad because they give their children smallpox to prevent their getting it, and maniacs because they cheerfully communicate to their children a certain and terrible illness with the object of preventing an uncertain one. The English on their side say: 'The other Europeans are cowardly and unnatural: cowardly in that they are afraid of giving a little pain to their children, and unnatural because they expose them to death from smallpox some time in the future. To judge who is right in this dispute, here is the history of this famous inoculation which is spoken of with such horror outside England'. Well, you have probably guessed that this is Voltaire, writing in the late 1720s. Voltaire visited England — probably the only instance in recorded history when an intellectual Frenchman has come to England and been impressed by what he found. Voltaire wrote beautifully in his Lettres Philosophiques — translated as Letters from England — on religion, politics, and literature. And he also wrote about science — he attended Newton's funeral and was awed by the fact that a humble scientist was buried like a king in Westminster Abbey. But I want to afford Voltaire an important place in the library that will help us define a literary tradition of science. He wrote superb expositions, lucid expositions, on Newton's theories of optics and gravitation. They still stand today. If you want to know what Newton said you can read Voltaire, as good as anything to be found. The atmosphere of this gathering tonight, celebrating a book written 30 years ago, really does reinforce my impression that we need a stronger sense of a scientific literary tradition. Those of us educated in a literary tradition take for granted a kind of mental map — a temporal map, really — of a literary history, a canon, a hierarchy if you like. The weight of the past, the cumulative achievements, give meaning to the achievements of the present. This canon has been vigorously challenged in the last 20 years — too male, too middle class, too white, too imperial, or whatever. But in order for it to be challenged it had to exist. One had to have Donne and Tennyson and Clough and Virginia Woolf, all placed in the firmament, waiting to be redefined, elevated further, or shot out of the sky. It seems to me that the pace of change in contemporary science, and the necessary passion for innovation, put us in danger of neglecting, or forgetting completely, what a beautiful and intricate tapestry of curiosity, persistence, human weakness and inspiration a scientific literary history could represent. One of Richard's achievements has been to extend an enjoyment of science to layman like myself. Permission has been granted, no apologies necessary. Just as we can enjoy and discuss opera, art, movies, poetry, without being composers or performers, painters, film directors or poets, so we can engage with this vast edifice, the sublime achievement of human creativity. But to move around inside this edifice, we need the temporal spaciousness of a literary past. This is Leeuwenhoek writing to the Royal Society in 1674, giving the first account of, among others, spyrogyra. He wrote his observations in letters to the Royal Society over a period of 50 years. And it is no accident that he should have sent his letters there. At that time, in a small space, within a triangle between London, Cambridge, and Oxford, and within a couple of generations, there existed nearly all the world's science. Newton, Locke, (I think generally we have to include certain philosophers in here, Hume most certainly), Willis, Hooke, Boyle, Wren, Flamsteed, Halley — an incredible concentration of talent, and the core of our library — its classical moment, if you like. A good question to ask about this tradition is, how important is it that what one reads is true? Do we exclude those who simply got it all wrong? I think we have to beware of writing a Whig history of science, a history of the victors. I think we need to remember phlogiston and the ether and protoplasm. Scientists who hurl themselves down dead alleys perform a service for everyone else — they save them a great deal of trouble. My son, William McEwan, last year completed an undergraduate biology course at UCL. When he was studying genetics, he told me he was advised to read no papers written before 1997. One can see the point of this advice. In the course of his studies, estimates of the size of the human genome shrank by a factor of three. Such is the headlong nature of contemporary science. But if we understand science merely as a band of light moving through time, advancing on the darkness, and leaving darkness behind it, always at its best only in the incandescent present, we turn our backs on a magnificent and eloquent literature, an epic tale of ingenuity propelled by curiosity. I raise my hat to that lovely phrase — "shuffled into oblivion". The analogy with cards — the hand being the information, the cards themselves as the genes — is precise and informative — true eloquence. 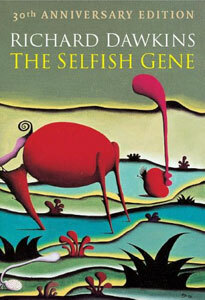 The Selfish Gene would have to have a central place in our tradition, as would many other of Richard's books. In particular, Unweaving the Rainbow has a powerful appeal to the literary imagination. There is no time to discuss the nineteenth century's contribution — Darwin's Origin, and of course, The Expression, or Huxley's "On a Piece of Chalk". And when we come to the present, our parlor game intensifies, for we are wallowing in riches. The Selfish Gene initiated a golden age of science writing. With a fine sense of literary tradition, Steven Weinberg in his book Dreams of a Final Theory, revisited Huxley's famous essay in order to make the case for reductionism. Among many other 'classics' I would propose E. O. Wilson on the beauties of the Amazon rain forest, and on the teeming microorganisms in a handful of soil, Steven Weinberg again on the aesthetics of scientific theories, David Deutsch's The Fabric of Reality, Matt Ridley, unweaving the opposition of nature and nurture. And recently, too Dan Dennett, always conscious of Hume as well as Dawkins, laying out for us the memetics of faith. In fact, I'll end with a consideration of religion, because a very important part of Richard's work has been to address it. He has refused to gloss over the innate contradictions of reason and faith. None of us, I think, in the mid-'70s, when The Selfish Gene was published, would have thought we'd be devoting so much mental space now to confront religion. We thought that matter had long been closed. Here is another bit of prose that I would want carved into my library — perhaps over the door as you go in. This is a man who's just been threatened with indefinite imprisonment and torture, unless he signs on the dotted line. Ian McEwan's contribution Copyright © 2006 by Ian McEwan. All rights reserved. And now we come to RICHARD DAWKINS for an afterword. In one way there's nothing to be said, because a great deal has been said, and unless you're living on Mars you know a great deal about Richard Dawkins, but I think he deserves to be set up like everyone else. It's a dead hand to say he needs no introduction; he does need no introduction, but here's a short one. Richard has done more than anyone to clarify one of the most fundamental and enduring ideas in all of science — the theory of evolution by natural selection. In The Selfish Gene and, not least, The Extended Phenotype, he showed how evolution could be understood as the differential success of genes in making their way down the generations by means of adaptations. Adaptations being the familiar 'design features' of living things: eyes, wings, brains, fins. From this gene's-eye view of evolution, all the numerous, often previously disparate studies of living things come together. Genetics, game theory, population biology, phylogeny, development, animal behaviour — all become mutually transparent. As a bonus to experts and lay-readers alike, he has also made these dramatic developments accessible to a wider public in his string of international bestsellers, so lucid and so readable, as Ian has told us. This year marks not only the thirtieth anniversary of The Selfish Gene but also the twentieth anniversary of The Blind Watchmaker and the tenth of Climbing Mount Improbable. These and other memorable titles — River Out of Eden, The Ancestor's Tale — have all been praised both for their scientific insights and their brilliant literary style. As a result, Richard has the rare honour of being a Fellow both of the Royal Society and of the Royal Society for Literature. In sum, Richard Dawkins is widely regarded as one of the most influential thinkers and writers in the world today. And it is my pleasure to invite him to provide an afterword to this evening. This is of course a wonderful occasion for me. I'm very moved and very grateful, not just to Helena and the LSE and to the OUP for organizing it, to the other speakers, and to Melvyn Bragg for chairing it. I'm sometimes asked if there's any unifying philosophy in all my plumbing activities, and I find it quite hard to answer. I suppose I'm a lover of explanation. I love to reduce complex mysteries by means of simple explanations. And I suppose that makes me a reductionist, but the word means so many different things, and is to some people a dirty word. It's one thing to reduce, in the sense of trying to find simple explanations for complex phenomena, and in that sense I'm proud to be a reductionist. But if it's taken to mean reducing in the sense of demeaning, or underestimating, the beauty, the complexity, of that which we're trying to explain, then I would not own up to it. I want to do full justice to the complexity of that which we're trying to explain — while all the time seeking the simplest possible explanation for it. So in that sense I am a reductionist; I'm a materialist. As to whether I'm a determinist, I'll let you know when I've decided. This is not just an anniversary of several books, as Melvyn has said, it's also the launch of the book edited by Alan Grafen and Mark Ridley. I can't actually bring myself to say the title; modesty forbids. But it is a collection of essays and I'm very very grateful to all the authors — 25 of them — of this collection. Dan Dennett's contribution to this book of essays is called "The Selfish Gene as a Philosophical Essay," and it begins: "Probably most scientists would shudder at the prospect of having a work of theirs described as a philosophical treatise. You really know how to hurt a guy. Why don't you just say you disagree with my theory, instead of insulting me?" Well I think one respect in which I am philosophical is this: although I'm very interested in the way life is, I'm also fascinated by the question "Are there aspects of life that just had to be so?" For example, it's a matter of fact that the genetics that we know is digital, both at the Mendelian level of the independent assortment of genes in pedigrees, and also at the Watson and Crick level of the digital information within each gene. That's a fact. But is the digitalness of genetics just a fact, or is it something that had to be so, for life to work at all? Whether you call such an approach philosophical or not, that's what I'm interested in. And my suspicion is that genetics did indeed have to be digital, in order at least for evolution by natural selection to work, and I further suspect that evolution by natural selection is also a necessary condition for all of life, wherever life may be found anywhere in the universe. This is my Universal Darwinism claim, and it's the one that Dennett was quoting as getting me into trouble with a fellow biologist for being too philosophical. Now if you take your science as narrowly evidential, you'll say something like, "Since you've never seen life on another planet other than this one, how can you possibly say anything about the way life might be universally, on other planets.?" On the face of it that sounds like a reasonable complaint, but on the other hand there surely must be some things that theory tells us must be so. And it can't be right to rule out of bounds everything that we can't see with our own eyes. The extraterrestrial perspective, by the way, is the inspiration for choosing the Desmond Morris painting "The Expectant Valley," which was on the original hardback edition of The Selfish Gene and has been revived in the 30th anniversary retro edition. So what are the general principles of life, wherever life might be found? I just want to suggest some candidates, as a sort of stimulus to get other people thinking of others. First, Darwinism itself. I've mentioned that. I think it's universal. Can't prove it, but I think it is. Second, digital genetics, with very low mutation rate. Does it have to be DNA? Presumably not. Does it have to be a polynucleotide? Possibly not. Does it have to have a triplet code? Almost certainly not. Et cetera; those are the kinds of questions I'm trying to ask. Does it have to be one-dimensional? (The DNA code is a one-dimensional string of digits.) Or could it be two-dimensional; could it be a two-dimensional array? I suspect that it probably could. Could it be three-dimensional? Almost certainly not, because a three-dimensional code is very hard to read out of. But there does have to be something three-dimensional, and in our form of life it's provided by proteins. Proteins are the three-dimensional executives which are specified by the one-dimensional genetic code and which in their turn specify the whole of embryology and hence the rest of life. Sexual recombination. In our form of life this could be said to be a prerequisite for the existence of what we call species — not in the boring taxonomist's sense, but in the sense of an entity which has a gene pool in which information is passed on. Multicellularity. Life as we know it on this planet is either small or is built up from large numbers of small units, which we call cells. Is this something that had to be so? Or could one imagine a life form which was large, and yet not cellular? There are lots more questions of that general type, which I haven't got time to go into. But every time I meet a biochemist, the first question I always ask them is, would you please devise for me an alternative biochemistry? And see how different it is possible to be and still, at least in theory, work. Next question might be, does the information have to be molecular at all? Dan Dennett's already referred to memes. This is not something that I've ever wanted to push as a theory of human culture, but I originally proposed it as a kind of — almost an anti-gene point, to make the point that Darwinism requires accurate replicators with phenotypic power, but they don't necessarily have to be genes. What if they were computer viruses? They hadn't been invented when I wrote The Selfish Gene so I went straight for memes, units of cultural inheritance. I want to say a little bit, which I actually also said in the new preface to the 30th anniversary edition, so I won't spend long on it — about the title The Selfish Gene. I don't think it's a great title. I'm quite pleased with some of my other titles, but I don't think this is one of my best. It can — it has — given rise to misunderstanding. The best way to explain it is by correctly locating the emphasis. If you emphasize "selfish," then you will think the book is about selfishness. But it isn't, it's mostly about altruism. The correct word of the title to stress is "gene," and that's not because I ever thought that genes are deterministic in the sense that is politically objectionable to some people; it's because of a debate within Darwinism. The central debate within Darwinism concerns the unit that is actually selected, the kind of thing which becomes more or less numerous in a pool of such entities. That unit will become, more or less by definition, selfish, in this sense. Altruism would then be favored at other levels. So if natural selection chooses between species, then you could write a book called The Selfish Species, and we would then expect individual organisms to behave for the good of the species. That isn't the way it is — it is in fact the selfish gene, which means that we expect, and see, individual organisms behaving for the good of their genes, which may mean altruistic behavior at the level of the individual organism. And that's quite largely what the book is about. I can see how the title The Selfish Gene could be misunderstood, especially by those philosophers, not here present, who prefer to read a book by title only, omitting the rather extensive footnote which is the book itself. Alternative titles could well have been The Immortal Gene, The Altruistic Vehicle, or indeed The Cooperative Gene. The book could equally well have been called The Cooperative Gene, and it would scarcely have needed to be changed at all. One of the main points in the book is that genes in a sense do cooperate — not that groups of genes prosper at the expense of rival groups, but rather each gene is seen as pursuing its own self-interested agenda against the background of the other genes in the gene pool: the set of candidates for sexual shuffling within a species. Those other genes should be thought of as part of the climate, part of the context, part of the environmental background against which genes are selected. Rather like the weather. Natural selection under those conditions will see to it that gangs of mutually compatible genes will arise, each one selected for its capacity to cooperate with the others that it is likely to meet in bodies, which means the other genes of the gene pool of the species — that's in the case of a sexual species. Given that natural selection for selfish genes in that sense tends to favor cooperation, we then have to admit that there are some genes that do no such thing, and work against the interests of the rest of the genome, and these are the things that Matt was talking about, the true selfish DNA. And there's a bit of a terminological problem arises here, which I think Matt glanced at. Selfish DNA, in the sense of Orgel and Crick, and Doolittle and Sapienza is DNA which works at the expense of the rest of the genome. Selfish genes in my sense also include genes which actually cooperate — when they build bodies. Because a body is a cooperative enterprise of many genes. So they are still selfish genes in my original sense, but they're not selfish genes in the sense of Orgel and Crick. So some people have resorted to the use of the phrase "ultra selfish genes" — or "outlaw genes" — to distinguish those. 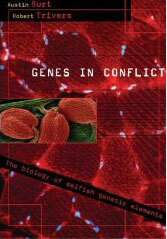 A new book has appeared, very recently, unfortunately too recently to be quoted in my preface to the new edition, by Robert Trivers and Austin Burt, called Genes in Conflict, which is the last word on this subject. Bob Trivers's name reminds me, and it's a source of particular joy, that the 30th anniversary edition has restored the original forward by him, which was in the first edition, and which was somehow cut out of the second edition. Bob Trivers is one of the four intellectual heroes of the book, the others mentioned being Bill Hamilton, John Maynard Smith, and George Williams — there are of course many others, because I really need to stress that my book is more a summary of ideas of others, and I'd be quite embarrassed if it were thought that I were claiming them for myself — the neo-Darwinian synthesis of Fisher, Haldane, and Wright already — indeed going back as far as Weisman — I think, foreshadowed the idea of the selfish gene very explicitly. But as I was saying, I'm delighted that Bob Trivers's original foreword is back. Not only is it a beautifully crafted introduction to the book; unusually he chose the medium of a book foreword to announce to the world a brilliant new idea, his theory of the evolution of self-deception. Which would grace any scientific paper, and I'm very grateful to him for giving permission for the original foreword to go into this anniversary edition. "Fascinating, but at times I wish I could unread it . . . On one level, I can share in the sense of wonder Dawkins so evidently sees in the workings-out of such complex processes . . . But at the same time, I largely blame The Selfish Gene for a series of bouts of depression I suffered from for more than a decade . . . Never sure of my spiritual outlook on life, but trying to find something deeper – trying to believe, but not quite being able to – I found that this book just about blew away any vague ideas I had along these lines, and prevented them from coalescing any further. This created quite a strong personal crisis for me some years ago." I previously, in another book, Unweaving the Rainbow, described similar reactions. There was a man in New Zealand who said he couldn't sleep for three nights after reading it; and a teacher in Canada wrote to say that a pupil of his had come to him in tears, because reading The Selfish Gene had convinced her that life was futile and not worth living. He drew her attention to the occasion when Lenin was placed in a sealed train, in case the bacillus of Leninism should leak out when he was transported back to Russia, and he advised this young woman to show the book to none of her friends. "We can even discuss ways of deliberately cultivating and nurturing pure, disinterested altruism – something that has no place in nature, something that has never existed before in the whole history of the world. We are built as gene machines and cultured as meme machines, but we have the power to turn against our creators. We, alone on earth can rebel against the tyranny of the selfish replicators." [MELVYN BRAGG:] Thank you very much. You've been generous with your applause but I'd like to thank all the speakers for their splendidly stimulating and original talks and their clarity and extraordinary concision. We are all immensely grateful to them. And [email protected] would like to thank Oxford University Press for supporting this event. And thanks to LSE Conferences and Events office, which dealt with a stampede for tickets so unprecedented that, within a few minutes, both the server and phone lines had crashed. I'm sure I'm speaking for everyone on this platform to express our gratitude for the extraordinary efficiency and the best briefing in the world from Helena Cronin. As one person said in reply to the standard question: "Where did you hear about this event? ": "The whole world is talking about it. " To mark the 30th anniversary of Richard Dawkins's book, OUP is to issue a collection of essays about his work. Here, professor of psychology at Harvard University, wonders if Dawkins's big idea has not gone far enough. I AM A COGNITIVE SCIENTIST, someone who studies the nature of intelligence and the workings of the mind. Yet one of my most profound scientific influences has been Richard Dawkins, an evolutionary biologist. The influence runs deeper than the fact that the mind is a product of the brain and the brain a product of evolution; such an influence could apply to someone who studies any organ of any organism. The significance of Dawkins's ideas, for me and many others, runs to his characterisation of the very nature of life and to a theme that runs throughout his writings: the possibility of deep commonalities between life and mind. In The Selfish Gene, Dawkins, in typical, robust style, rips up the idea of evolution as it was then understood and substitutes his vision of natural selection. Animals and plants do not use genes to self-replicate, he argues. It is the other way round. 'We are robot vehicles blindly programmed to preserve the selfish molecules known as genes,' he states. Thus the egg not only comes before the chicken, it runs the animal's entire life. Daniel Dennett's main claim to fame is through his membership of a triumvirate of intellectual heavyweights who have waged war on behalf of Charles Darwin and his theories. The British zoologist Richard Dawkins, based at Oxford University, and the Harvard biologist and ant expert Edward O. Wilson make up the rest of this group. Each is committed, fiercely, to the idea that evolutionary theory is sufficient to explain our world, all living things and our own species. Call in any other force to elucidate our existence and you are indulging in sheer intellectual sloppiness, they argue. Three decades after Richard Dawkins revolutionised our understanding of living things with The Selfish Gene, evidence has accumulated to back his cold-eyed vision of how bodies, families and society are shaped by the simple "duplicate me" message in our genetic instructions.